Last weekend I made another visit to Yamato Sushi (map, 616 Davie St, Vancouver, BC, Canada, phone: 604-682-5494). It’s a hole-in-the-wall Japanese restaurant on the edge of Yaletown that is popular for take-out but also has a few tables for eating in. I ordered a bunch of my favorite items including the miso soup, ebi sunomono salad, chopped scallop roll, nigiri sushi (tamago, inari and ikura), and an unagi cone. My friend ordered the vegetarian bento box and an avocado roll. Everything was really good, but one note is that the rice on the chopped scallop roll seemed not quite as fluffy as I usually like. But in general I have been happy with the quality of food at Yamato and the prices are quite reasonable for the downtown area (my meal including tax and tip came to $19). I live in the area and Yamato is a place where I often bring my friends, who are visiting from other parts of the Lower Mainland. I made a video of our food (that’s pretty appetizing I think) and you can watch it on Youtube (or on Blip.tv) or use the player below. Until next time, hope you enjoy the many amazing restaurants in Vancouver and the Greater Vancouver / BC Lower Mainland area. 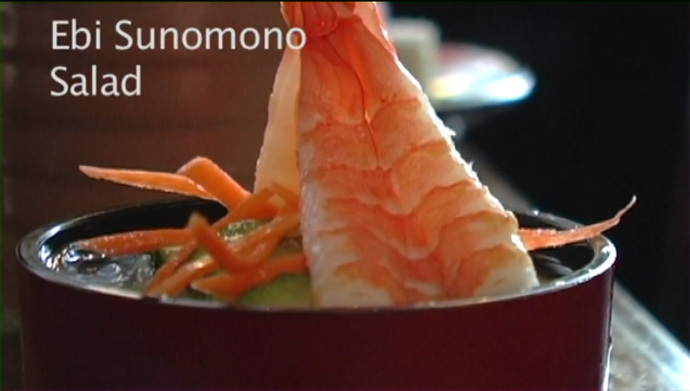 Ebi Sunomono Salad from Yamato Sushi Japanese restaurant on Davie Street in downtown Vancouver BC Canada. Chopped Scallop roll and assorted sushi from Yamato Sushi Japanese restaurant on Davie Street in downtown Vancouver BC Canada. Tsui Hang Village Chinese Restaurant (map, 1193 Granville St, Vancouver, BC, phone: 604-683-6868) is a large, well kept Chinese restaurant near the Granville Street night-club entertainment district at the corner of Davie and Granville. Popular with the after-bar crowd, Tsui Hang is open very late at night (even until 3 or 4 in the morning – but be sure to call them to confirm) and gets busy with talkative night-clubbers recovering from an evening dancing and imbibing. The airy dining room is well lit and nicely maintained with some beautiful oriental vases displayed high above the dining room floor. Upon overhearing me remarking to my friend on the vases, the waiter interjected that they are “not real”. But although the decorative vases may be imitations, the food at Tsui Hang is definitely the real thing. 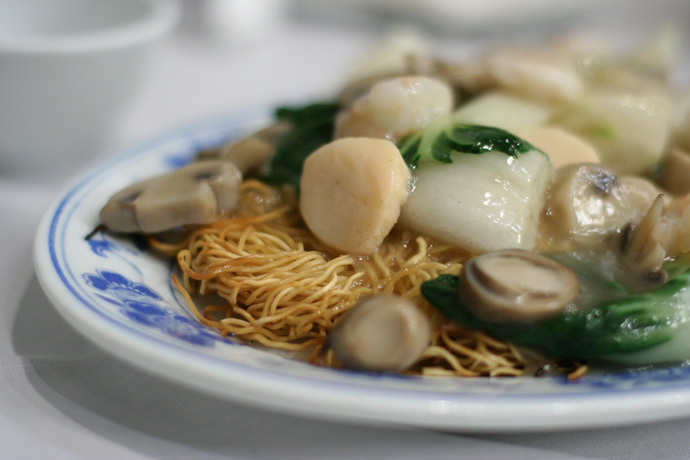 If you’re a fan of Chinese seafood dishes, you’ll appreciate the menu (which is quite extensive and has a variety of vegetarian items too). We ordered the Sauteed Rock Cod Fillets ($14.50, pictured below) and the Mixed Seafood Chow Mein ($13.50, also pictured below). The food was really tasty, the fish tender and enveloped in a delectable and nuanced sauce – even receiving positive comments from my dining companion who is of Asian descent. We also ordered a bowl of steamed rice ($2.00) which was quite large and nicely accompanied the two dishes. Looking for something quick and on-the-go? Tsui Hang also has a take out window facing Davie Street which offers specials like sweet and sour pork on rice and chow mein for around $5.00. 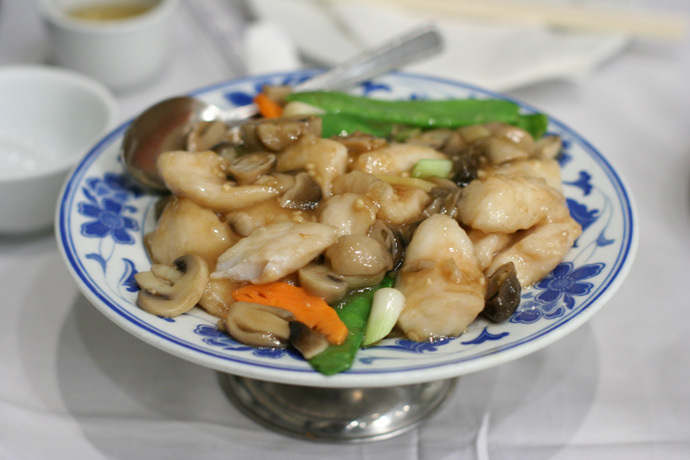 Sauteed Rock Cod Fillets ($14.50) from Tsui Hang Village Chinese Restaurant on Granville Street, Vancouver, BC, Canada. Mixed Seafood Chow Mein ($13.50) from Tsui Hang Village Restaurant in downtown Vancouver BC Canada (Granville Entertainment district). 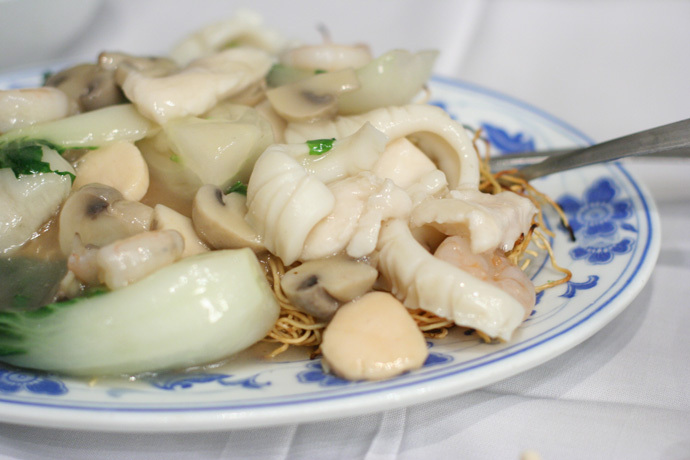 Another shot of the same Mixed Seafood Chow Mein dish from Tsui Hang Chienese Restaurant on Granville Street in Vancouver. Yamato Sushi Restaurant (map, 616 Davie St, Vancouver, BC, Canada, phone: 604-682-5494) is a hole-in-the-wall Japanese restaurant in downtown Vancouver with amazingly low prices (considering its downtown location) and pretty good quality for the money. 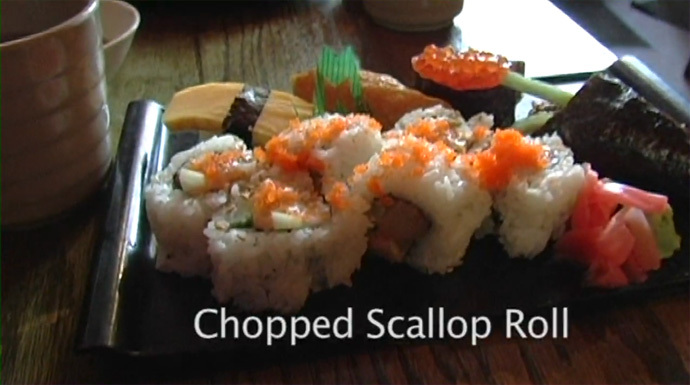 I ordered one of their sushi combinations ($6.65, shown in video below) which included 4 pieces of Nigiri sushi, a California roll, and miso soup. It was presented nicely and tasted good. For a direct link to the video I made, please click here. For some more photos please view Part 1. Sushi combo ($6.65 including Miso Soup) from Yamato Sushi in Vancouver. View More Restaurants in the Davie Street category. We hope you enjoy the great Davie Street restaurants on Dine Out Here Vancouver.